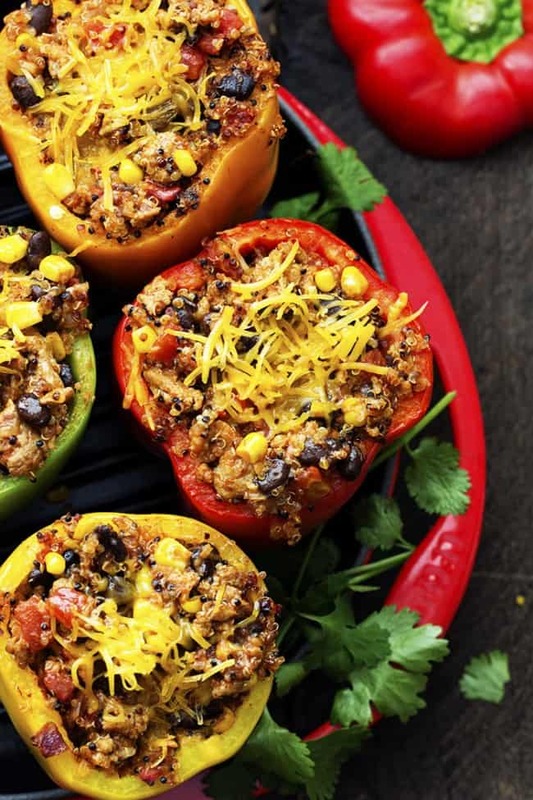 Delicious and healthy mexican turkey stuffed peppers with quinoa. 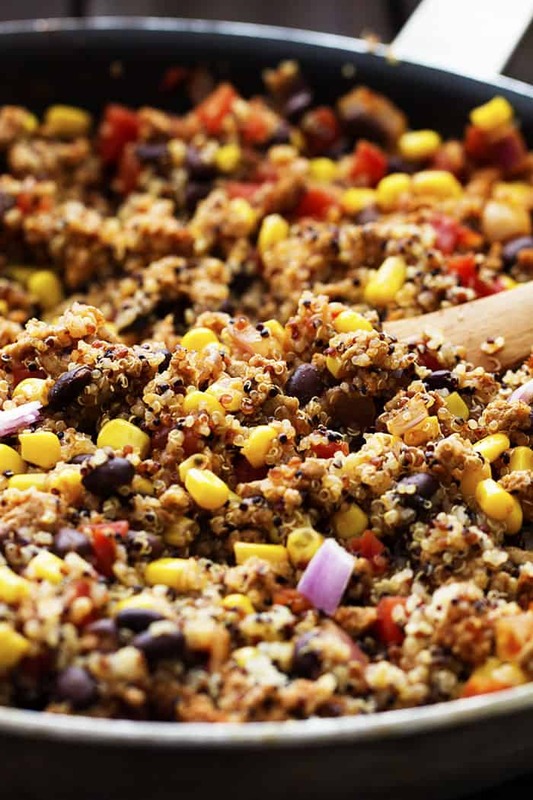 Quinoa provides added protein, fiber and minerals and a delicious new texture! It has been a week or so since I posted my last post. How are those resolutions coming? I have loved hearing all of “little victories” that you have been having. It has really kept me on track this month with my eating goals. I have been making swaps for healthier foods and having little victories for myself! One thing that I love to add into my diet is quinoa. It has such a unique texture and has so many health benefits. Not only is it great for supporting weight loss and management, it has protein, fiber and minerals. I loved using this Kroger® Tri Color Quinoa in these stuffed peppers. It added so many benefits but also gave it little pops of color to the peppers. So many healthy swaps were made in these peppers and it still added such great flavor. One thing that I love to swap out for my family is turkey meat. They don’t seem to notice a difference and it is leaner and adds more protein. I absolutely love to make stuffed peppers. 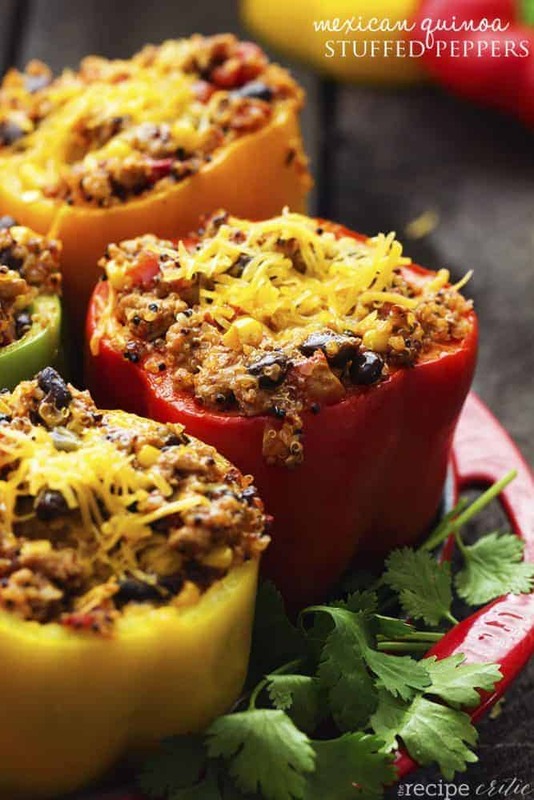 It gives everyone their own individual pepper that is stuffed to the brim with goodness. All of the Mexican flavors that our family loves were represented in these peppers. From the heathy veggies to the spices, everything came together perfectly inside of these peppers. They were so delicious and I especially love the bright and fun colors of the peppers. Healthier ingredients and big on taste! These peppers were a huge hit with the family. I know that your family will love them just as much as we did and be a hit at your house! Don’t forget to enter in Kroger’s Huge Giveaway! and 2 runner ups will each win a $500 Kroger Gift Card! Woot woot! Just enter through the rafflecopter below! Cook the quinoa according to package directions. Slice the tops of the peppers and clean out the membranes. Set aside. In a large skillet, brown the lean ground turkey. Right before it is fully cooked, add the red onion and garlic and cook until tender. Remove from heat. Add the tomato paste, black beans, diced tomatoes, sweet corn, quinoa, chili powder, cumin, lime juice, and salt and pepper to taste. Mix well and add 1 cup shredded cheese. Scoop the mixture into the insides of the peppers. Top with remaining cheese. Bake at 350 degrees for about 20 minutes until the peppers start to soften and the insides are heated throughout. 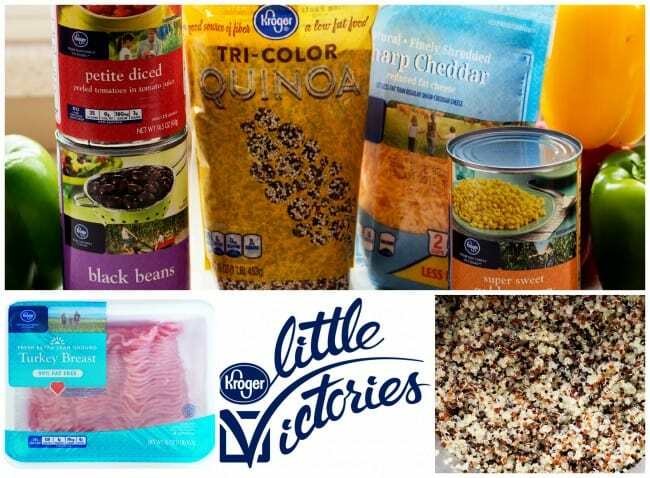 I am working with Kroger on this Little Victories campaign, and this post has been sponsored. I’m so glad to be able to work with companies and organizations that I support 100%. Thank you for supporting them, too. I wonder if these would freeze well? I’m going to try it. These look yummy! These look amazing! Definitely going to try them. These look amazing! The give away is also amazing! I make a vegetarian version that is similar, but I like the idea of using ground turkey! When I’m feeling particularly lazy I just make the quinoa filling with a low-sodium enchilada sauce and don’t even mess with stuffing the peppers…it’s still great! What is the nutritional breakdown for this recipe? It looks amazing! I would love to see more of your recipes but the pop up ads and screen blocking crap is very distracting. There should not be any pop up ads or screen blocking. If you can send me a screenshot to my email therecipecritic@gmail.com to replicate the issue I can get it fixed. As far as the ads on the sides, bottom, and top, that is how I support my family.